Harriet is 13 years old. She has been with RHO Appleseed School since the very beginning in August of 2011. 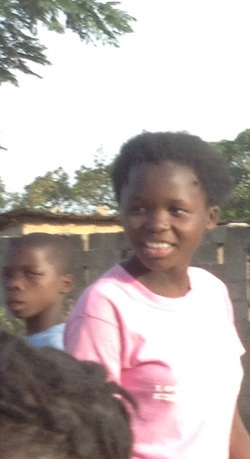 She is at the age where many Zambian girls tend to drop out of school. We are very happy that she has chosen to stay and we work hard to keep her involved and happy so that she will remain. She lives with her mother, father and 7 siblings. Her mother does not work and her father is a security guard. Security guards in Lusaka typically work 6 days a week and make about 350 Kwatcha, which is approximately $65 per month. Mr. and Mrs. Koka said that they hope that their kids can get a good education and are grateful for Appleseed School. The meals that the Harriet and her sister get at school are very helpful, because sometimes they do not have enough to feed the family everyday. They are also very grateful to Harriet's sponsor for helping with school fees, uniforms and supplies.